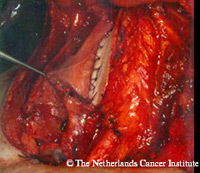 Voice rehabilitation after (sub)total laryngopharyngectomy with or without esophagectomy traditionally only has been possible with an electrolarynx. 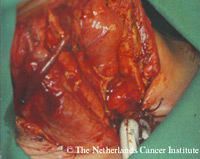 Reconstruction of the pharyngeal defect after subtotal pharyngectomy, with only a small strip of mucosa left, can best be achieved with a pectoralis major myocutaneous (PM) flap (figure right). 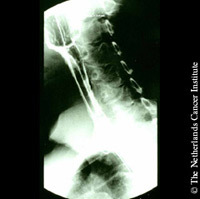 The barium swallow of this reconstruction is shown in the figure below. We have the experience that primary insertion of a Provox or Provox2 voice prosthesis after the application of a PM-flap results in a relatively good voice which is comparable to that after a standard operation. We, therefore, prefer this method of reconstruction over the removal of the remaining mucosa strip and reconstruction of the pharynx with a free revascularized jejunum flap. 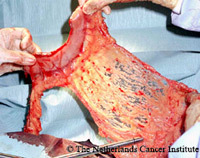 The advantages of the PM-flap over the free jejunum flap are obvious: the PM-flap is readily available, is easily harvested, and requires little extra operation time; if constructed properly, there is little chance of stenosis; no abdominal surgery and no special microsurgical expertise are needed. Compared to a gastric pull-up operation (if a total esophagectomy is not indicated) the jejunum flap has some advantages: no need for esophagectomy, less abdominal trauma, no intra-thoracic trauma, no postoperative dumping syndrome, and primary prosthetic voice rehabilitation is possible. Alternatives are the use of a revascularized tubed radial fore arm flap or a revascularized tubed greater curvature of the stomach (see figures). If the total laryngopharyngectomy has to be combined with total esophagectomy, reconstruction with a gastric pull-up procedure is our method of choice. A relevant observation in this respect is the improved vocalization by using a greater curvature tube instead of the complete stomach. 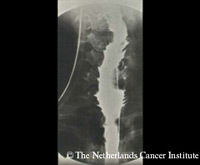 The figure to the left shows an intra-operative picture of the tubed stomach pull-up in the neck and below to the right the postoperative barium swallow; note the excellent diameter of the tube, which is comparable to the normal esophageal diameter; the figure to the left shows a Provox voice prosthesis in situ in the lumen of a tubed stomach). 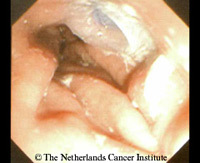 The voice obtained with the tubed stomach clearly has a better intelligibility and loudness. Other advantages of a greater curvature tube over a complete gastric pull-up are: the transposition through the esophageal bed is less difficult, and there is less intra-thoracic cardio-pulmonary compression, and dumping. The use of a tubed free radial forearm flap or revascularized tubed greater curvature of the stomach instead of a jejunum, which we recently have applied, also shows promising results. An example of the latter is shown below. in virtually all patients and should be aimed for. It can be concluded that in pharyngeal reconstruction, besides oncological and technical arguments, the possibility of applying primary instead of secondary prosthetic voice rehabilitation and the quality of the resulting voice should also play a role in the choice of the reconstruction method. 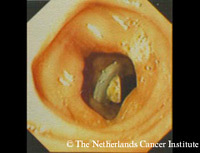 Some examples of voices after pharyngeal reconstruction.